Now that we have the lens PSF it should be straight forward to reverse its blurring effect out of the image, right? The next few articles will outline the first tiny few steps towards achieving perfect capture sharpening, that is deconvolution of an image by the Point Spread Function (PSF) of the lens used to capture it. This is admittedly a complex subject, fraught with a myriad ever changing variables even in a lab, let alone in the field. But studying it can give a glimpse of the possibilities and insights into the processes involved. I will explain the steps I followed and show the resulting images and measurements. Jumping the gun, the blue line below represents the starting system Spatial Frequency Response (SFR), the black one unattainable/undesirable perfection and the orange one the result of part of the process outlined in this series. Figure 1. Spatial Frequency Response of the imaging system before and after Richardson-Lucy deconvolution by the PSF of the lens that captured the original image. Just in case anyone was wondering (I was), it turns out that my smartphone camera produces a better SMI color score off a ColorChecker Passport target than a full frame Nikon D610 DSLR . While checking some out-of-gamut tones on an xy Chromaticity Diagram I started to wonder how far two tones needed to be in order for an observer to notice a difference. Were the tones in the yellow and red clusters below discernible or would they be indistinguishable, all being perceived as the same ‘color’? Figure 1. 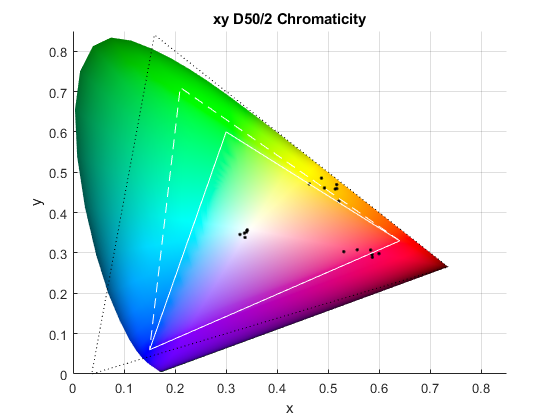 Samples off an image plotted on a typical xy Chromaticity diagram (black dots). We’ve seen how humans perceive color in daylight as a result of three types of photoreceptors in the retina called cones that absorb wavelengths of light from the scene with different sensitivities to the arriving spectrum. Figure 1. Quantitative Color Science. Figure 2. Bayer Color Filter Array: RGGB layout. Image under license from Cburnett, pixels shifted and text added. 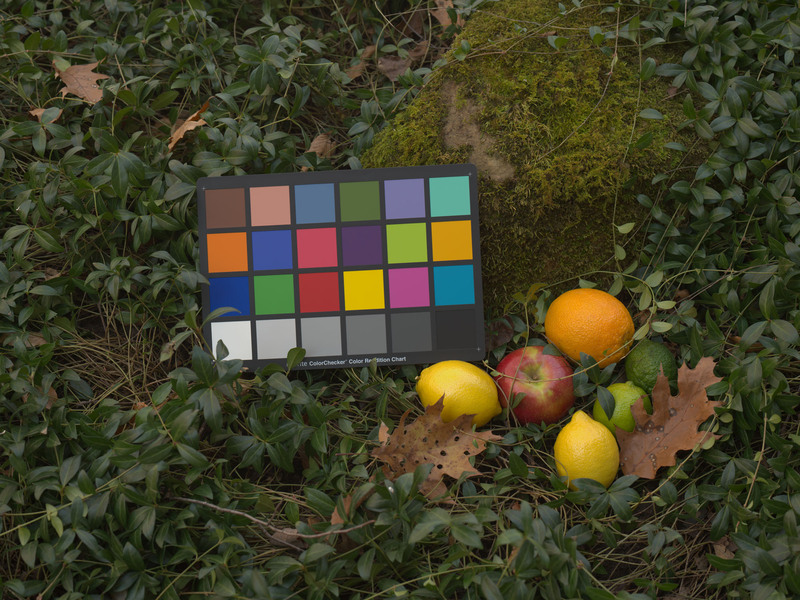 Over the last two posts we’ve been exploring some of the differences introduced by tweaks to the Color Filter Array of the Phase One IQ3 100MP Trichromatic Digital Back versus its original incarnation, the Standard Back. Refer to those for the background. In this article we will delve into some of these differences quantitatively. Figure 1. Optimized Linear Compromise Color Matrices for the Phase One IQ3 100 MP Standard and Trichromatic Backs under approximately D65 light. We have seen in the last post that Phase One apparently performed a couple of main tweaks to the Color Filter Array of its Medium Format IQ3 100MP back when it introduced the Trichromatic: it made the shapes of color filter sensitivities more symmetric by eliminating residual transmittance away from the peaks; and it boosted the peak sensitivity of the red (and possibly blue) filter. It did this with the objective of obtaining more accurate, less noisy color out of the hardware, requiring less processing and weaker purple fringing to boot. Both changes carry the compromises discussed in the last article so the purpose of this one and the one that follows is to attempt to measure – within the limits of my tests, procedures and understanding – the effect of the CFA changes from similar raw captures by the IQ3 100MP Standard Back and Trichromatic, courtesy of David Chew. We will concentrate on color accuracy, leaving purple fringing for another time. Figure 1. Phase One IQ3 100MP image rendered linearly via a dedicated color matrix from raw data without any additional processing whatsoever: no color corrections, no tone curve, no sharpening, no nothing. Brightness adjusted to just avoid clipping. Capture by David Chew. It is always interesting when innovative companies push the envelope of the state-of-the-art of a single component in their systems because a lot can be learned from before and after comparisons. 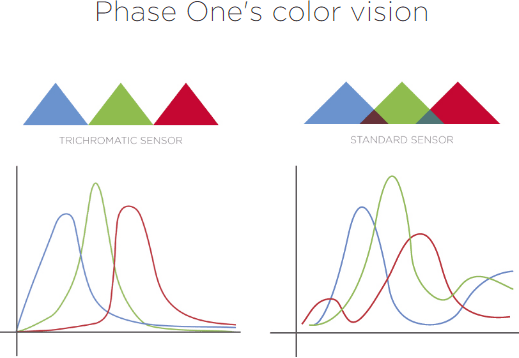 I was therefore excited when Phase One introduced a Trichromatic version of their Medium Format IQ3 100MP Digital Back last September because it could allows us to isolate the effects of tweaks to their Bayer Color Filter Array, assuming all else stays the same. Figure 1. IQ3 100MP Trichromatic (left) vs the rest (right), from PhaseOne.com. 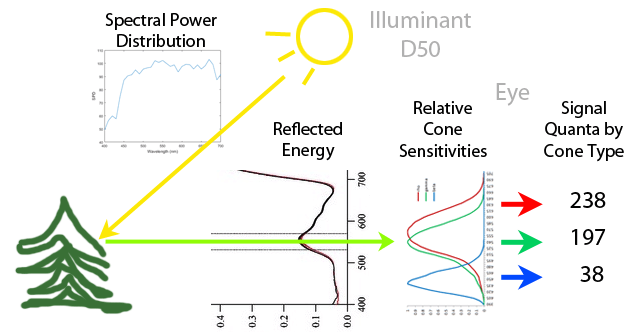 Units are not specified but one would assume that the vertical axis is relative spectral sensitivity and the horizontal axis represents wavelength. In this article we shall find that the effect of a Bayer CFA on the spatial frequencies and hence the ‘sharpness’ captured by a sensor compared to those from a corresponding monochrome imager can go from (almost) nothing to halving the potentially unaliased range based on the chrominance content of the image projected on the sensing plane and the direction in which the spatial frequencies are being stressed. In the last article we saw that the Point Spread Function and the Modulation Transfer Function of a lens could be easily obtained numerically by applying Discrete Fourier Transforms to its generalized exit pupil function twice in sequence. Obtaining the 2D DFTs is easy: simply feed MxN numbers representing the two dimensional complex image of the pupil function in its space to a Fast Fourier Transform routine and, presto, it produces MxN numbers that represent the amplitude of the PSF on the sensing plane. Figure 1a shows a simple case where pupil function is a uniform disk representing the circular aperture of a perfect lens with MxN = 1024×1024. Figure 1b is the resulting intensity PSF. Figure 1. 1a Left: Array of numbers representing a circular aperture (zeros for black and ones for white). 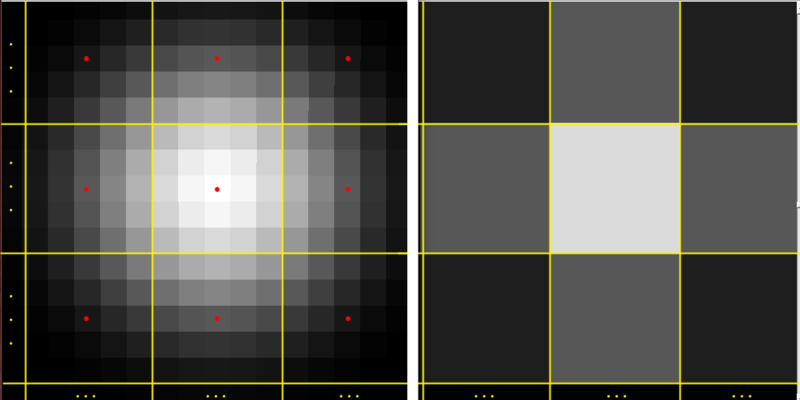 1b Right: Array of numbers representing the PSF of image 1a (contrast slightly boosted). Goodman, in his excellent Introduction to Fourier Optics, describes how an image is formed on a camera sensing plane starting from first principles, that is electromagnetic propagation according to Maxwell’s wave equation. If you want the play by play account I highly recommend his math intensive book. But for the budding photographer it is sufficient to know what happens at the exit pupil of the lens because after that the transformations to Point Spread and Modulation Transfer Functions are straightforward, as we will show in this article. Figure 1. 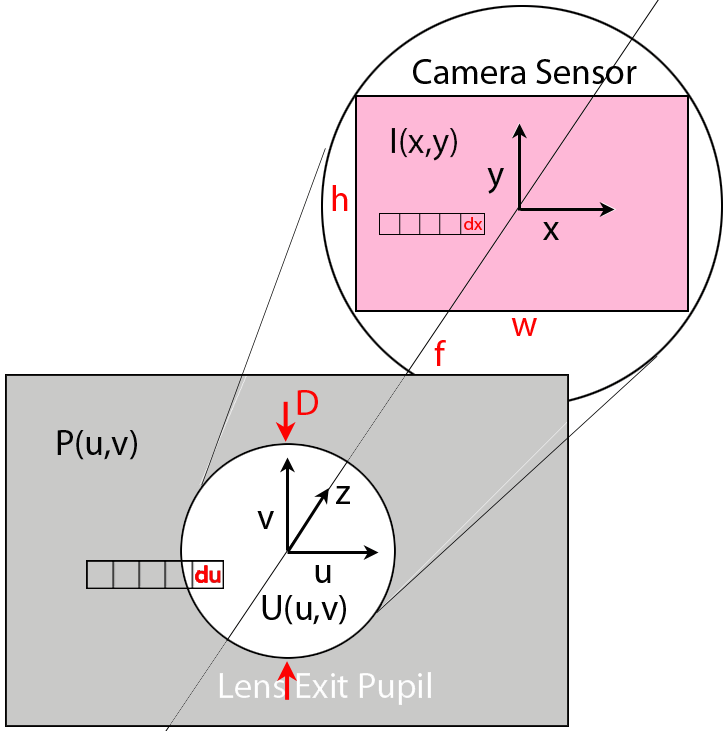 Simplified schematic diagram of the space between the exit of a camera lens and its sensing plane. The space is filled with air. 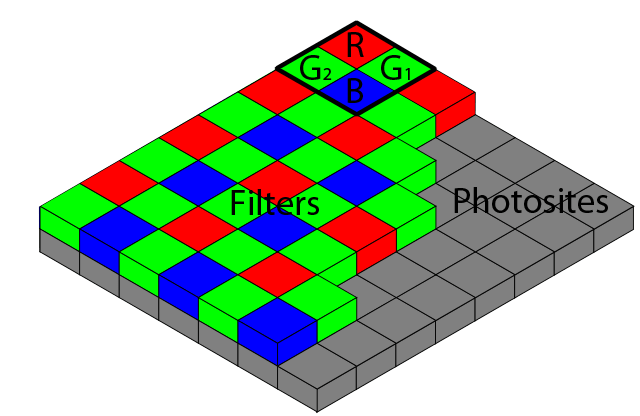 Now that we know how to create a 3×3 linear matrix to convert white balanced and demosaiced raw data into connection space – and where to obtain the 3×3 linear matrix to then convert it to a standard output color space like sRGB – we can take a closer look at the matrices and apply them to a real world capture chosen for its wide range of chromaticities. Figure 1. Image with color converted using the forward linear matrix discussed in the article. How do we translate captured image information into a stimulus that will produce the appropriate perception of color? It’s actually not that complicated. Recall from the introductory article that a photon absorbed by a cone type ( , or ) in the fovea produces the same stimulus to the brain regardless of its wavelength. Take the example of the eye of an observer which focuses on the retina the image of a uniform object with a spectral photon distribution of 1000 photons/nm in the 400 to 720nm wavelength range and no photons outside of it. This article will set the stage for a discussion on how pleasing color is produced during raw conversion. The easiest way to understand how a camera captures and processes ‘color’ is to start with an example of how the human visual system does it. Light from the sun strikes leaves on a tree. The foliage of the tree absorbs some of the light and reflects the rest diffusely towards the eye of a human observer. The eye focuses the image of the foliage onto the retina at its back. Near the center of the retina there is a small circular area called the foveola which is dense with light receptors of well defined spectral sensitivities called cones. Information from the cones is pre-processed by neurons and carried by nerve fibers via the optic nerve to the brain where, after some additional psychovisual processing, we recognize the color of the foliage as green. Figure 1. The human eye absorbs light from an illuminant reflected diffusely by the object it is looking at. Figure 1. Nikon D610 with AF-S 24-120mm f/4 lens at 24mm f/8 ISO100, minimally rendered from raw by Octave/Matlab following the steps outlined in the article. This post will continue looking at the spatial frequency response measured by MTF Mapper off slanted edges in DPReview.com raw captures and relative fits by the ‘sharpness’ model discussed in the last few articles. The model takes the physical parameters of the digital camera and lens as inputs and produces theoretical directional system MTF curves comparable to measured data. As we will see the model seems to be able to simulate these systems well – at least within this limited set of parameters. Table 1. The cameras and lenses under test. The series of articles starting here outlines a model of how the various physical components of a digital camera and lens can affect the ‘sharpness’ – that is the spatial resolution – of the images captured in the raw data. In this one we will pit the model against MTF curves obtained through the slanted edge method from real world raw captures both with and without an anti-aliasing filter. We now know how to calculate the two dimensional Modulation Transfer Function of a perfect lens affected by diffraction, defocus and third order Spherical Aberration – under monochromatic light at the given wavelength and f-number. In digital photography however we almost never deal with light of a single wavelength. So what effect does an illuminant with a wide spectral power distribution, going through the color filter of a typical digital camera CFA before the sensor have on the spatial frequency responses discussed thus far? Spherical Aberration (SA) is one key component missing from our MTF toolkit for modeling an ideal imaging system’s ‘sharpness’ in the center of the field of view in the frequency domain. In this article formulas will be presented to compute the two dimensional Point Spread and Modulation Transfer Functions of the combination of diffraction, defocus and third order Spherical Aberration for an otherwise perfect lens with a circular aperture. Figure 1. Top: an ideal spherical lens focuses all rays on the same focal point. Bottom: a practical lens with Spherical Aberration focuses rays that go through the exit pupil based on their radial distance from the optical axis. 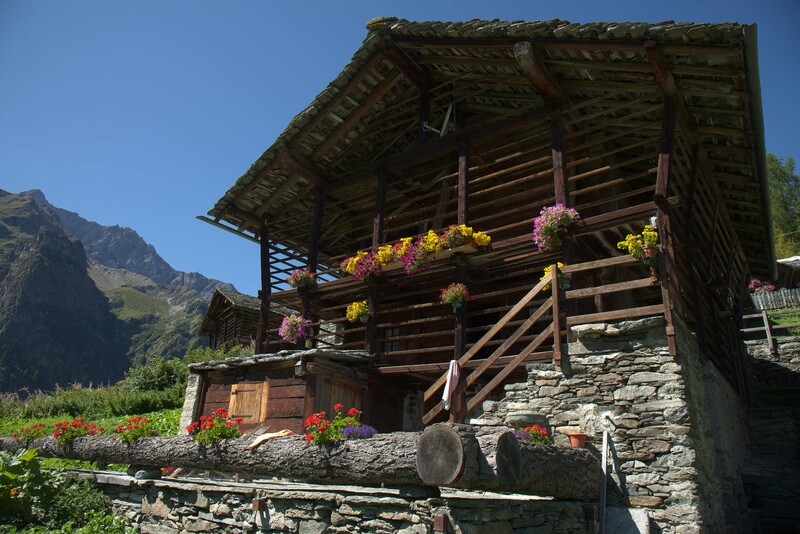 Image courtesy Andrei Stroe. This series of articles has dealt with modeling an ideal imaging system’s ‘sharpness’ in the frequency domain. We looked at the effects of the hardware on spatial resolution: diffraction, sampling interval, sampling aperture (e.g. a squarish pixel), anti-aliasing OLPAF filters. The next two posts will deal with modeling typical simple imperfections in the system: defocus and spherical aberrations. Figure 1. Top to bottom: Back Focus, In Focus, Front Focus. To the right is how the relative PSF would look like on the sensing plane. Image under license courtesy of Brion. 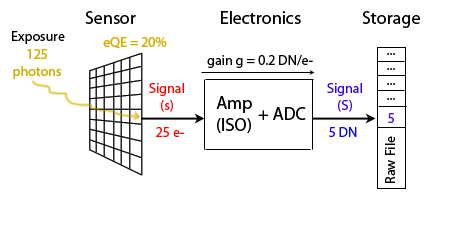 This article will discuss a simple frequency domain model for an AntiAliasing (or Optical Low Pass) Filter, a hardware component sometimes found in a digital imaging system. The filter typically sits right on top of the sensing plane and its objective is to block as much of the aliasing and moiré creating energy above the Nyquist spatial frequency while letting through as much as possible of the real image forming energy below that, hence the low-pass designation. Figure 1. The blue line indicates the pass through performance of an ideal anti-aliasing filter presented with an Airy PSF (Original): pass all spatial frequencies below Nyquist (0.5 c/p) and none above that. No filter has such ideal characteristics and if it did its hard edges would result in undesirable ringing in the image. Figure 2. Typical Optical Low Pass Filter implementation in a current Digital Camera, courtesy of Nikon USA (yellow displacement ‘d’ added). This article is about specifying the units of the Discrete Fourier Transform of an image and the various ways that they can be expressed. This apparently simple task can be fiendishly unintuitive. Figure 1. Airy disc image. Left, 1a, 3D representation, zoomed in. Right, 1b, as it would appear on the sensing plane. The hats in this case mean the Fourier Transform of the relative component normalized to 1 at the origin ( ), that is the individual MTFs of the perfect lens PSF, the perfect square pixel and the delta grid. Sampling is expressed mathematically as a Dirac delta function at the center of each pixel (the red dots below). Figure 1. Left, 1a: A highly zoomed (3200%) image of the lens PSF, an Airy pattern, projected onto the imaging plane where the sensor sits. Pixels shown outlined in yellow. A red dot marks the sampling coordinates. Right, 1b: The sampled image zoomed at 16000%, 5x as much, because each pixel’s width is 5 linear units on the side. While perusing Jim Kasson’s excellent Longitudinal Chromatic Aberration tests I was impressed by the quantity and quality of the information the resulting data provides. Longitudinal, or Axial, CA is a form of defocus and as such it cannot be effectively corrected during raw conversion, so having a lens well compensated for it will provide a real and tangible improvement in the sharpness of final images. How much of an improvement? For the purposes of ‘sharpness’ spatial resolution measurement in photography cameras can be considered shift-invariant, linear systems. My camera has a 14-bit ADC. Can it accurately record information lower than 14 stops below full scale? Can it store sub-LSB signals in the raw data? This article is a little esoteric so one may want to skip it unless one is interested in the underlying mechanisms that cause quantization error as photographic signal and noise approach the darkest levels of acceptable dynamic range in our digital cameras: one least significant bit in the raw data. We will use our simplified camera model and deal with Poissonian Signal and Gaussian Read Noise separately – then attempt to bring them together. Physicists and mathematicians over the last few centuries have spent a lot of their time studying light and electrons, the key ingredients of digital photography. In so doing they have left us with a wealth of theories to explain their behavior in nature and in our equipment. In this article I will describe how to simulate the information generated by a uniformly illuminated imaging system using open source Octave (or equivalently Matlab) utilizing some of these theories. Since as you will see the simulations are incredibly (to me) accurate, understanding how the simulator works goes a long way in explaining the inner workings of a digital sensor at its lowest levels; and simulated data can be used to further our understanding of photographic science without having to run down the shutter count of our favorite SLRs. This approach is usually referred to as Monte Carlo simulation. Whether the human visual system perceives a displayed slow changing gradient of tones, such as a vast expanse of sky, as smooth or posterized depends mainly on two well known variables: the Weber-Fechner Fraction of the ‘steps’ in the reflected/produced light intensity (the subject of this article); and spatial dithering of the light intensity as a result of noise (the subject of a future one). We’ve seen how information about a photographic scene is collected in the ISOless/invariant range of a digital camera sensor, amplified, converted to digital data and stored in a raw file. For a given Exposure the best information quality (IQ) about the scene is available right at the photosites, only possibly degrading from there – but a properly designed** fully ISO invariant imaging system is able to store it in its entirety in the raw data. It is able to do so because the information carrying capacity (photographers would call it the dynamic range) of each subsequent stage is equal to or larger than the previous one. Cameras that are considered to be (almost) ISOless from base ISO include the Nikon D7000, D7200 and the Pentax K5. All digital cameras become ISO invariant above a certain ISO, the exact value determined by design compromises. In this article we’ll look at a class of imagers that are not able to store the whole information available at the photosites in one go in the raw file for a substantial portion of their working ISOs. The photographer can in such a case choose out of the full information available at the photosites what smaller subset of it to store in the raw data by the selection of different in-camera ISOs. Such cameras are sometimes improperly referred to as ISOful. Most Canon DSLRs fall into this category today. As do kings of darkness such as the Sony a7S or Nikon D5. In the last few posts I have made the case that Image Quality in a digital camera is entirely dependent on the light Information collected at a sensor’s photosites during Exposure. Any subsequent processing – whether analog amplification and conversion to digital in-camera and/or further processing in-computer – effectively applies a set of Information Transfer Functions to the signal that when multiplied together result in the data from which the final photograph is produced. Each step of the way can at best maintain the original Information Quality (IQ) but in most cases it will degrade it somewhat. This point is key: in a well designed imaging system** the final image IQ is only as good as the scene information collected at the sensor’s photosites, independently of how this information is stored in the working data along the processing chain, on its way to being transformed into a pleasing photograph. As long as scene information is properly encoded by the system early on, before being written to the raw file – and information transfer is maintained in the data throughout the imaging and processing chain – final photograph IQ will be virtually the same independently of how its data’s histogram looks along the way. In photography, digital cameras capture information about the scene carried by photons reflected by it and store the information as data in a raw file pretty well linearly. Data is the container, scene information is the substance. There may or may not be information in the data, no matter what its form. With a few limitations what counts is the substance, information, not the form, data. 2) Choosing what part of the Signal to store in the raw data and what part to leave behind. The second step is only necessary if your camera is incapable of storing the entire Signal at once (that is it is not ISO invariant) and will be discussed in a future article. In this post we will assume an ISOless imaging system. Ever since Einstein we’ve been able to say that humans ‘see’ because information about the scene is carried to the eyes by photons reflected by it. So when we talk about Information in photography we are referring to information about the energy and distribution of photons arriving from the scene. The more complete this information, the better we ‘see’. No photons = no information = no see; few photons = little information = see poorly = poor IQ; more photons = more information = see better = better IQ. 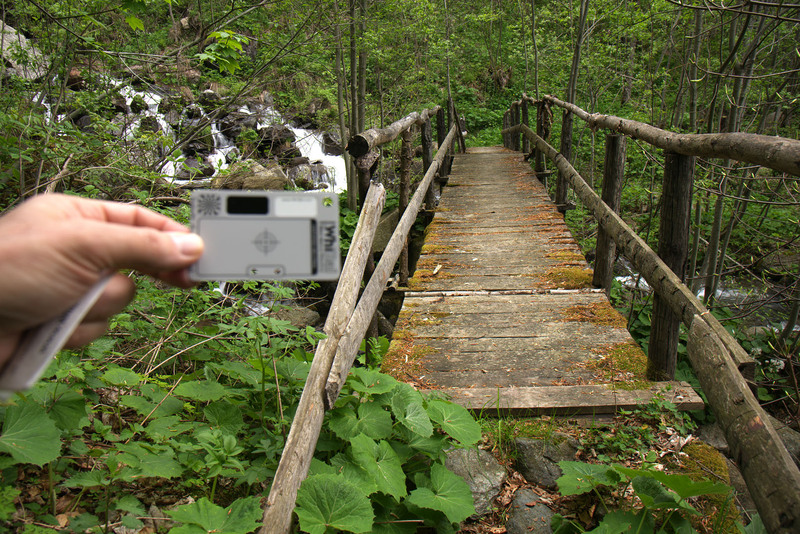 Sensors in digital cameras work similarly, their output ideally being the energy and location of every photon incident on them during Exposure. That’s the full information ideally required to recreate an exact image of the original scene for the human visual system, no more and no less. In practice however we lose some of this information along the way during sensing, so we need to settle for approximate location and energy – in the form of photoelectron counts by pixels of finite area, often correlated to a color filter array. My camera sports a 14 stop Engineering Dynamic Range. What bit depth do I need to safely fully encode all of the captured tones from the scene with a linear sensor? As we will see the answer is not 14 bits because that’s the eDR, but it’s not too far from that either – for other reasons, as information science will show us in this article. When photographers talk about grayscale ‘tones’ they typically refer to the number of distinct gray levels present in a displayed image. They don’t want to see distinct levels in a natural slow changing gradient like a dark sky: if it’s smooth they want to perceive it as smooth when looking at their photograph. So they want to make sure that all possible tonal information from the scene has been captured and stored in the raw data by their imaging system. It is a key Image Quality metric because photography is all about contrast, and dynamic range limits the range of recordable/displayable tones. Different components in the imaging system have different working dynamic ranges and the system DR is equal to the dynamic range of the weakest performer in the chain. Most of the photographs captured these days end up being viewed on a display of some sort, with at best 4K (4096×2160) but often no better than HD resolution (1920×1080). Since the cameras that capture them have typically several times that number of pixels, 6000×4000 being fairly normal today, most images need to be substantially downsized for viewing, even allowing for some cropping. Resizing algorithms built into browsers or generic image viewers tend to favor expediency over quality, so it behooves the IQ conscious photographer to manage the process, choosing the best image size and downsampling algorithm for the intended file and display medium. When downsizing the objective is to maximize the original spatial resolution retained while minimizing the possibility of aliasing and moirè. In this article we will take a closer look at some common downsizing algorithms and their effect on spatial resolution information in the frequency domain. Raw Converter Sharpening with Sliders at Zero? I’ve mentioned in the past that I prefer to take spatial resolution measurements directly off the raw information in order to minimize often unknown subjective variables introduced by demosaicing and rendering algorithms unbeknownst to the operator, even when all relevant sliders are zeroed. In this post we discover that that is indeed the case for ACR/LR process 2010/2012 and for Capture NX-D – while DCRAW appears to be transparent and perform straight out demosaicing with no additional processing without the operator’s knowledge. Are micro Four Thirds Lenses Typically Twice as ‘Sharp’ as Full Frame’s? In fact the question is more generic than that. 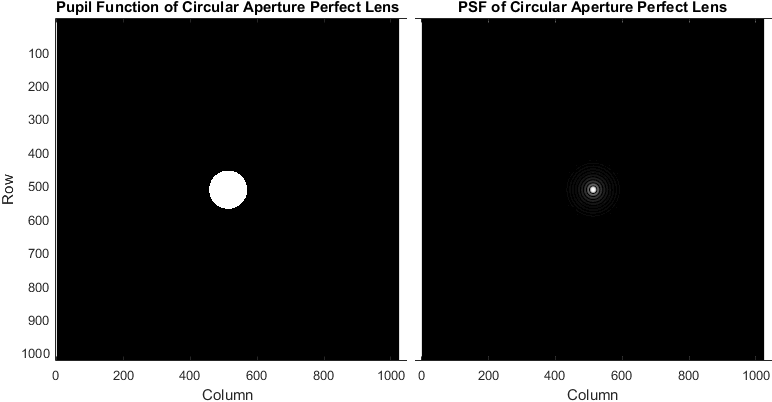 Smaller format lens designers try to compensate for their imaging system geometric resolution penalty (compared to a larger format when viewing final images at the same size) by designing ‘sharper’ lenses specifically for it, rather than recycling larger formats’ designs (feeling guilty APS-C?) – sometimes with excellent effect. Are they succeeding? I will use mFT only as an example here, but input is welcome for all formats, from phones to large format. There are several ways to extract Sensor IQ metrics like read noise, Full Well Count, PRNU, Dynamic Range and others from mean and standard deviation statistics obtained from a uniform patch in a camera’s raw file. In the last post we saw how to do it by using such parameters to make observed data match the measured SNR curve. In this one we will achieve the same objective by fitting mean and standard deviation data. Since the measured data is identical, if the fit is good so should be the results. We’ve seen how to model sensors and how to collect signal and noise statistics from the raw data of our digital cameras. 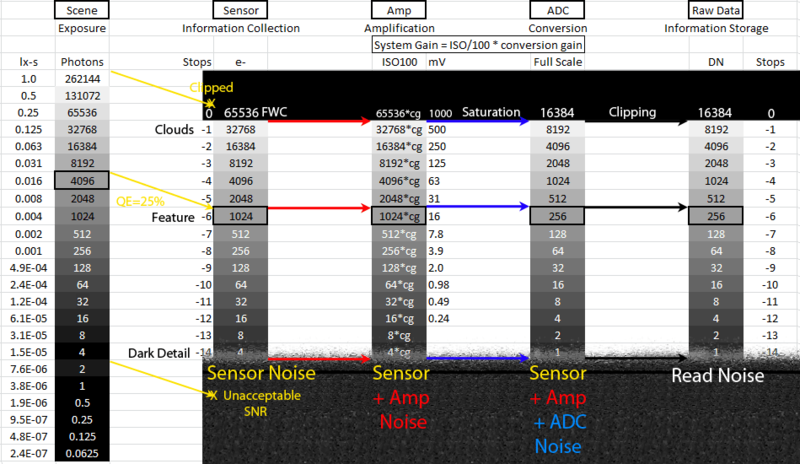 In this post I am going to pull both things together allowing us to estimate sensor IQ metrics: input-referred read noise, clipping/saturation/Full Well Count, Dynamic Range, Pixel Response Non-Uniformities and gain/sensitivity. There are several ways to extract these metrics from signal and noise data obtained from a camera’s raw file. I will show two related ones: via SNR in this post and via total noise N in the next. The procedure is similar and the results are identical. Imperfections in an imaging system’s capture process manifest themselves in the form of deviations from the expected signal. We call these imperfections ‘noise’. The fewer the imperfections, the lower the noise, the higher the image quality. However, because the Human Visual System is adaptive within its working range, it’s not the absolute amount of noise that matters to perceived Image Quality (IQ) as much as the amount of noise relative to the signal – represented for instance by the Signal to Noise Ratio (SNR). That’s why to characterize the performance of a sensor in addition to signal and noise we also need to determine its sensitivity and the maximum signal it can detect. Over the last couple of years I’ve been using Frans van den Bergh‘s excellent open source MTF Mapper to measure the Modulation Transfer Function of imaging systems off a slanted edge target, as you may have seen in these pages. As long as one understands how to get the most out of it I find it a solid product that gives reliable results, with MTF50 typically well within 2% of actual in less than ideal real-world situations (see below). I had little to compare it to other than to tests published by gear testing sites: they apparently mostly use a commercial package called Imatest for their slanted edge readings – and it seemed to correlate well with those. Then recently Jim Kasson pointed out sfrmat3, the matlab program written by Peter Burns who is a slanted edge method expert who worked at Kodak and was a member of the committee responsible for ISO12233, the resolution and spatial frequency response standard for photography. sfrmat3 is considered to be a solid implementation of the standard and many, including Imatest, benchmark against it – so I was curious to see how MTF Mapper 0.4.1.6 would compare. It did well. A reader suggested that a High-Res Olympus E-M5 Mark II image used in the previous post looked sharper than the equivalent Sony a6000 image, contradicting the relative MTF50 measurements, perhaps showing ‘the limitations of MTF50 as a methodology’. That would be surprising because MTF50 normally correlates quite well with perceived sharpness, so I decided to check this particular case out. ‘Who are you going to believe, me or your lying eyes’? A great idea that could give a welcome boost to the ‘sharpness’ of this handy system. This preliminary test shows that the E-M5 mk II 64MP High-Res mode gives in this case a 10-12% advantage in MTF50 linear spatial resolution compared to the Standard Shot 16MP mode. Plus it apparently virtually eliminates the possibility of aliasing and moiré. Great stuff, Olympus. So, is it true that a Four Thirds lens needs to be about twice as ‘sharp’ as its Full Frame counterpart in order to be able to display an image of spatial resolution equivalent to the larger format’s? It is, because of the simple geometry I will describe in this article. In fact with a few provisos one can generalize and say that lenses from any smaller format need to be ‘sharper’ by the ratio of their sensor linear sizes in order to produce the same linear resolution on same-sized final images. This is one of the reasons why Ansel Adams shot 4×5 and 8×10 – and I would too, were it not for logistical and pecuniary concerns. focal length changes proportionally to sensor size in order to capture identical scene content on a given sensor, all other things being equal. The first realization should be intuitive (future post). The second one is the subject of this post: I will deal with it through a couple of geometrical diagrams. Several sites perform spatial resolution ‘sharpness’ testing of imaging systems for photographers (i.e. ‘lens+digital camera’) and publish results online. You can also measure your own equipment relatively easily to determine how sharp your hardware is. However comparing results from site to site and to your own can be difficult and/or misleading, starting from the multiplicity of units used: cycles/pixel, line pairs/mm, line widths/picture height, line pairs/image height, cycles/picture height etc. This post will address the units involved in spatial resolution measurement using as an example readings from the slanted edge method. 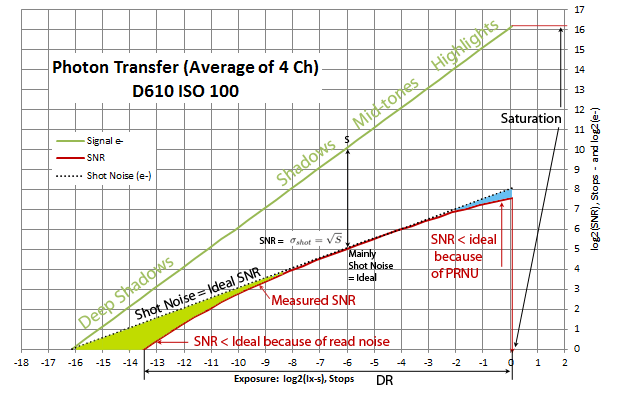 Determining the Signal to Noise Ratio (SNR) curves of your digital camera at various ISOs and extracting from them the underlying IQ metrics of its sensor can help answer a number of questions useful to photography. For instance whether/when to raise ISO; what its dynamic range is; how noisy its output could be in various conditions; or how well it is likely to perform compared to other Digital Still Cameras. As it turns out obtaining the relative data is a little time consuming but not that hard. All you need is your camera, a suitable target, a neutral density filter, dcraw and free ImageJ, Octave or (pay) Matlab. One of the fairest ways to compare the performance of two cameras of different physical characteristics and specifications is to ask a simple question: which photograph would look better if the cameras were set up side by side, captured identical scene content and their output were then displayed and viewed at the same size? Achieving this set up and answering the question is anything but intuitive because many of the variables involved, like depth of field and sensor size, are not those we are used to dealing with when taking photographs. In this post I would like to attack this problem by first estimating the output signal of different cameras when set up to capture Equivalent images. You have obtained a raw file containing the image of a slanted edge captured with good technique. How do you get the MTF curve of the camera and lens combination that took it? Download and feast your eyes on open source MTF Mapper by Frans van den Bergh. No installation required, simply store it in its own folder. My preferred method for measuring the spatial resolution performance of photographic equipment these days is the slanted edge method. It requires a minimum amount of additional effort compared to capturing and simply eye-balling a pinch, Siemens or other chart but it gives immensely more, useful, accurate, quantitative information in the language and units that have been used to characterize optical systems for over a century: it produces a good approximation to the Modulation Transfer Function of the two dimensional Point Spread Function of the camera/lens system in the direction perpendicular to the edge. Much of what there is to know about a system’s spatial resolution performance can be deduced by analyzing such a curve, starting from the perceptually relevant MTF50 metric, discussed a while back. And all of this simply from capturing the image of a black and white slanted edge, which one can easily produce and print at home. Why Raw? The question is whether one is interested in measuring the objective, quantitative spatial resolution capabilities of the hardware or whether instead one would prefer to measure the arbitrary, qualitatively perceived sharpening prowess of (in-camera or in-computer) processing software as it turns the capture into a pleasing final image. Either is of course fine. My take on this is that the better the IQ captured the better the final image will be after post processing. In other words I am typically more interested in measuring the spatial resolution information produced by the hardware comfortable in the knowledge that if I’ve got good quality data to start with its appearance will only be improved in post by the judicious use of software. By IQ here I mean objective, reproducible, measurable physical quantities representing the quality of the information captured by the hardware, ideally in scientific units. How Sharp are my Camera and Lens? What is the Effective Quantum Efficiency of my Sensor? I See Banding in the Sky. Is my Camera Faulty? This is a recurring nightmare for a new photographer: they head out with their brand new state-of-the art digital camera, capture a set of images with a vast expanse of sky or smoothly changing background, come home, fire them up on their computer, play with a few sliders and … gasp! … there are visible bands (posterization, stairstepping, quantization) all over the smoothly changing gradient. ‘Is my new camera broken? !’, they wonder in horror. How many photons impinge on a pixel illuminated by a known light source during exposure? 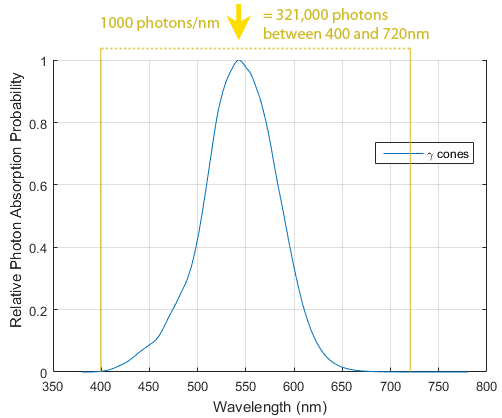 To answer this question in a photographic context we need to know the area of the pixel, the Spectral Power Distribution of the illuminant and the relative Exposure. 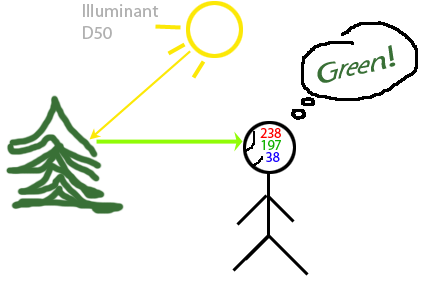 We know the pixel’s area and we know that the Spectral Power Distribution of a common class of light sources called blackbody radiators at temperature T is described by Spectral Radiant Exitance – so all we need to determine is what Exposure this irradiance corresponds to in order to obtain the answer. When first approaching photographic science a photographer is often confused by the unfamiliar units used. In high school we were taught energy and power in radiometric units like watts (W) – while in photography the same concepts are dealt with in photometric units like lumens (lm). Once one realizes that both sets of units refer to the exact same physical process – energy transfer – but they are fine tuned for two slightly different purposes it becomes a lot easier to interpret the science behind photography through the theory one already knows. It all boils down to one simple notion: lumens are watts as perceived by the Human Visual System. I measured the Spectral Photon Distribution of the three CFA filters of a Nikon D610 in ‘Daylight’ conditions with a cheap spectrometer. Taking a cue from this post I pointed it at light from the sun reflected off a gray card and took a raw capture of the spectrum it produced. Is MTF50 a good proxy for perceived sharpness? It turns out that the spatial frequencies that are most closely related to our perception of sharpness vary with the size and viewing distance of the displayed image. What is the Best Single Deconvolution PSF to Use for Capture Sharpening 1? A Point Spread Function is the image projected on the sensing plane when our cameras are pointed at a single, bright, infinitesimally small Point of light, like a distant star on a perfectly dark and clear night. Ideally, that’s also how it would appear on the sensing material (silicon) of our camera sensors: a singularly small yet bright point of light surrounded by pitch black. However a PSF can never look like a perfect point because in order to reach silicon it has to travel at least through an imperfect lens (1) of finite aperture (2), various filters (3) and only then finally land typically via a microlens on a squarish photosite of finite dimensions (4). The following approach will work if you know the MTF50 in cycles/pixel of your camera/lens combination as set up at the time that the capture you’d like to sharpen by deconvolution with a Gaussian PSF was taken.